The Genius Sierra 800 Screens are specifically made for those larger openings requiring a vertical drop screen system. Also a perfect specialty screen for projects involving screened in porches, patio areas or larger enclosed areas. This system comes standard with a Manual Chain Pull System with Hand Held Operating Wand to raise and lower the screen. Scroll to the bottom of this page for additional product details. Opening Width *: 30" 31" 32" 33" 34" 35" 36" 37" 38" 39" 40" 41" 42" 43" 44" 45" 46" 47" 48" 49" 50" 51" 52" 53" 54" 55" 56" 57" 58" 59" 60" 61" 62" 63" 64" 65" 66" 67" 68" 69" 70" 71" 72" 73" 74" 75" 76" 77" 78" 79" 80" 81" 82" 83" 84" 85" 86" 87" 88" 89" 90" 91" 92" 93" 94" 95" 96" 97" 98" 99" 100" 101" 102" 103" 104" 105" 106" 107" 108" 109" 110" 111" 112" 113" 114" 115" 116" 117" 118" 119" 120" 121" 122" 123" 124" 125" 126" 127" 128" 129" 130" 131" 132" 133" 134" 135" 136" 137" 138" 139" 140" 141" 142" 143" 144"
Opening Height *: 24" 25" 26" 27" 28" 29" 30" 31" 32" 33" 34" 35" 36" 37" 38" 39" 40" 41" 42" 43" 44" 45" 46" 47" 48" 49" 50" 51" 52" 53" 54" 55" 56" 57" 58" 59" 60" 61" 62" 63" 64" 65" 66" 67" 68" 69" 70" 71" 72" 73" 74" 75" 76" 77" 78" 79" 80" 81" 82" 83" 84" 85" 86" 87" 88" 89" 90" 91" 92" 93" 94" 95" 96"
Custom or Re-sizeable Kit *: Custom Made Screens - Custom Sized and Ready to Install. 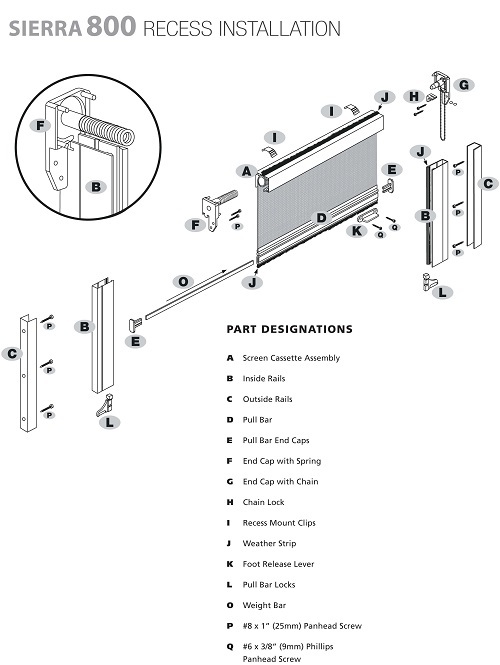 Re-sizable Screen Kit - Requires Custom Sizing & Final Assembly Prior to Installation. * We recommend a Miter Saw or Chop Saw with 80-100 Tooth Blade for Non-Ferrous Metals for cutting the screen components. Sierra 800 Screens are specifically made for those larger openings requiring a vertical drop screen system. Also a perfect specialty screen for projects involving screened in porches, patio areas or larger enclosed areas. This system comes standard with a Manual Chain Pull System to operate the screen. SCREEN CARE & USE:Retractable screens are designed to support fresh natural ventilation and to provide protection against small air born or crawling insects. Unlike 4-sided fixed framed screens, retractable screens retract in and out of a protective cassette so that you can enjoy an unobstructed view when the screen is not being used. The exposed surface area of the fabric is flexible. This means that during windy conditions or inclement weather, the screen should be retracted so that the fabric is hidden away and completely protected. 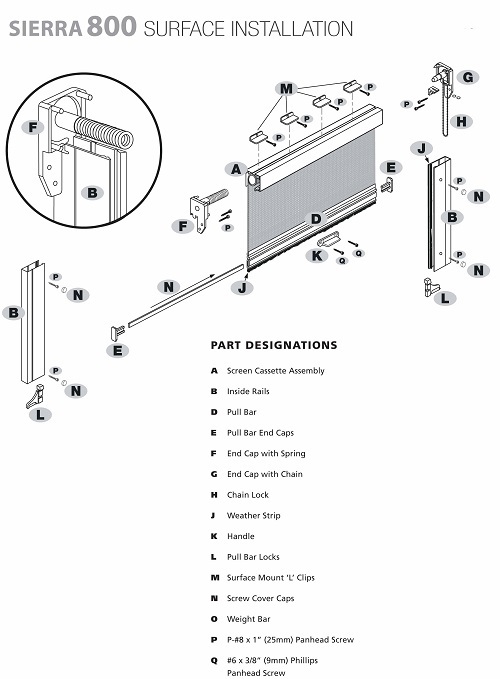 This screen is not intended to be left open and exposed continually to wind, sun, rain or other harsh conditions. When the screen is not being actively used to protect people or when it is windy, then it should be retracted. Wind can change the alignment of the screen so always make sure that the edges of the screen fabric are riding completely inside the guide rails before retracting the screen.